Can a Felon Get a Hunting License? After being released, many felons like to return to activities that they once enjoyed, such as hunting or fishing. This can be a great stress relief from looking for a job. Hunting is one of the more popular outdoor recreational activities in the United States as more than 16.7 million people hunt annually. In 2017, there were more than 36.82 million hunting licenses and permits purchased. 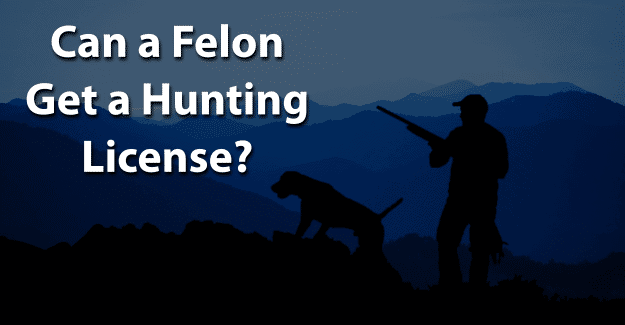 This blog post will address the question of whether or not a felon can get a hunting license. Hunting Without a License Anyway? A hunting license is a permit which allows someone to hunt animals recreationally or commercially and is required by law in order to hunt. Hunting licenses have been in use in the U.S. since the colonial days when states attempted to protect their land from non-residents hunting on it. The primary objective at that time was not to protect wildlife as is currently the case. A hunting license is typically issued by state or wildlife agencies, and can be either a card or a certificate. A hunting license allows someone to purchase hunting tags and enter hunting draws, and it serves as proof of completing a hunter safety-education course. Most states require that a person first take a Hunter Safety Education Course before being able to buy a hunting license, although the minimum age differs between states. Formal hunter education started 70 years ago to help ensure public safety. The purpose of hunter education is to develop knowledge, skills, and attitudes required to become a safe, responsible hunter. Hunter safety education includes classroom instruction by certified hunter safety instructors and online education programs that are approved by wildlife agencies. In most states the class or online portion is followed by a hands-on field day with a hunter-education instructor to complete the certification process to get a hunting license. The hunter education test typically includes a final written exam and a hands-on evaluation. A hunting license is not the same as a firearm license. The right to hunt is different from the right to own a gun in most states. In some states, a felon may be able to hunt with a crossbow or a compound bow. Neither of these is considered to be a firearm. Most states have a bow-hunting season in addition to a firearm-hunting season. Only the legal hunting method can be used during the appropriate season. In many states, it is possible for a convicted felon to have his gun rights restored through a governor’s pardon or a restoration of rights from the state’s clemency board. Unless these rights are restored, a felon cannot hunt with a gun even during any hunting season. Hunting without a license is generally considered to be a Class A or B misdemeanor, meaning legal advice will be needed. Punishment for this violation is usually a fine, which varies according to the state but can easily be the cost of the license plus a fee, often $50. Typically, an individual hunting without a license will be issued a citation for a Class A misdemeanor and ordered to appear in court and possibly be indicted. Paying the fine within 30 days will eliminate the need for a court appearance. Anyone not paying the fine can have the charge increased to a Class B misdemeanor and a higher fine plus possible jail time, usually up to 60 days. For felons who are already in the situation of any violation of the law resulting in jail time and a possible return to prison, it isn’t worth the risk. Possessing a gun for hunting would result in certain prison time. While this is true for any felon, those still on probation would also be in violation of those terms. This could result in a return to prison. Why not hunt without a license anyway? If you’re deep in the forest or the woods somewhere, who would know? However, there are reasons for anyone, especially felons, to comply with having a hunting license. First of all, felons who have completed their sentence are starting over and usually have committed to living an honest life. Hunting without a license is inconsistent with this new life they want to lead. It is a matter of integrity, which felons are usually not noted for anyway. This goes against that principle and is just another step in returning to a life of crime and going back to prison. For felons this is quite serious, and it is not worth the risk. For felons who are accustomed to hunting, it can be tempting to enjoy that activity again. They are not necessarily trying to break the law. It isn’t that expensive to buy a hunting license. But, it can be far costlier to break the law, earn a misdemeanor charge, and place themselves at risk for further legal problems. Felons shouldn’t be defined by their crime but they can enjoy hunting the right way. Don’t let them be one of the 2/3 returning to prison within the first two years after their release. Families of such felons can encourage them to obey the law and not hunt without a license. It is a part of learning to live an honest life. What do you think about this blog post about whether a felon can get a hunting license? Have you or someone you know got a hunting license? What was that like and was he or she successful? Please tell us in the comments below. Loosing my right to bare arms for my felon is a soul crushing thing for me. I was very responsible with a firearm. I think it would hard pressed to find one more respectful and law abiding of hunting regulations. More worthy of the game I had harvested. I didn’t want a hand gun or asalt rifle. I had one high quality shotgun for grouse hunting. Something I loved since I could carry a gun. At 60 years because if an adiction problem I’ve since delt with and a clean record Pryor I was arrested. Please offer me hope of a chance I once again I may persue my love of wing shooting. I would never would have done that nonviolent crime if I was not under the influence of a chemical which I was addicted. I have suffered so much already from this disease.